Embroidery is a dominant trend for the Autumn Winter season, showcased on shoes, skirts, jackets, tops, scarves, pants and even jewellery! It also happens to be one of the more wearable trends as you can add a touch with an accessory or small detail, go bold with a full embroidered piece or even make it colourful with bold embroidered pieces. It's also very appropriate for all ages and sizes as it can worn in so many different ways and lends itself well to many style personalities. Knits are key for the winter months, practical, stylish and most importantly warm, however they can also be bulky, oversized and sloppy adding visual weight. As always it comes down to the fabric weight and the fit of the garment. Watch out for drop shoulder sleeves, long jumpers, and heavy knits as you can lose your shape in these styles. A set in shoulder (true shoulder), lighter weight fabric and shorter style will suit everyone and balance your proportions. This particular knit is a successful combination of two key season styles as it is light, well cut, not too short and the embroidery is placed in a way that highlights the widest point of the shoulder. This detail balances the bust and arms, defines the waist and brings the eye up which distracts from the tummy and hips. The sleeve is actually a drop shoulder, but the embroidery brings the eye back in and rebalances the shape of the knit. It's a versatile piece which is perfect for all ages and can be dressed up and down. I've kept the looks more casual and without top layers to show off the embroidery, but a leather jacket, blazer or vest would suit this piece well. Tuck it into a pencil skirt for the office and try relaxed pants and sneakers for a casual weekend look. The colour, fabric weight and design will make it a good transeasonal piece. As it is a trend garment, don't expect to get much wear after mid spring, so go for the great price point and multi season design to make the most of this AW17 must have. The fit of a knit comes down to the proportions and fabric. Make sure you style it to fit you rather than just throw it on! Half tuck, cuff the sleeves, add a belt or wear more fitted bottoms to give it shape. For more inspiration and ideas, check out some of these styles and more through POLYVORE. 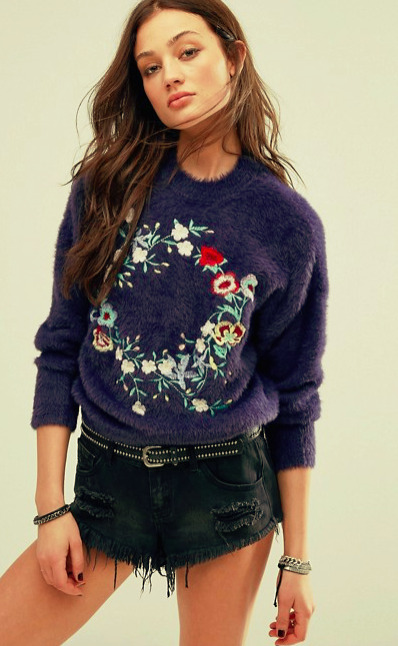 Simply search 'embroidered knit' and it will do the rest. Happy shopping!